The Nordland boat (called Nordlandsbåt in Norwegian) is an old type of fishing boat. In the northern counties of Norway and the Lofoten and Vesterålen islands fishing industry it has been used for several centuries. It is similar to Viking longships. The history and construction details of the traditional Norwegian boats are given in the book of Bernhard and Øystein Færøyvik, edited by Arne Emil Christensen, Inshore Craft of Norway, Grøndahl & Søn Forlag A.S., Oslo 1979, ISBN 82 504 0373 8. The model was built to plans of a "Fembøring" (ten-oared boat) from Rana, Nordland, Norway. The boat was built in 1847 and used in Lofoten fishing and for cod fishing off Finnmark until 1899. The plans of that boat were published in the book of Bernhard and Øystein Færøyvik (see above). The ship model is 1 : 20 scale. Length is 62 cm, width 16 cm, height 55 cm. 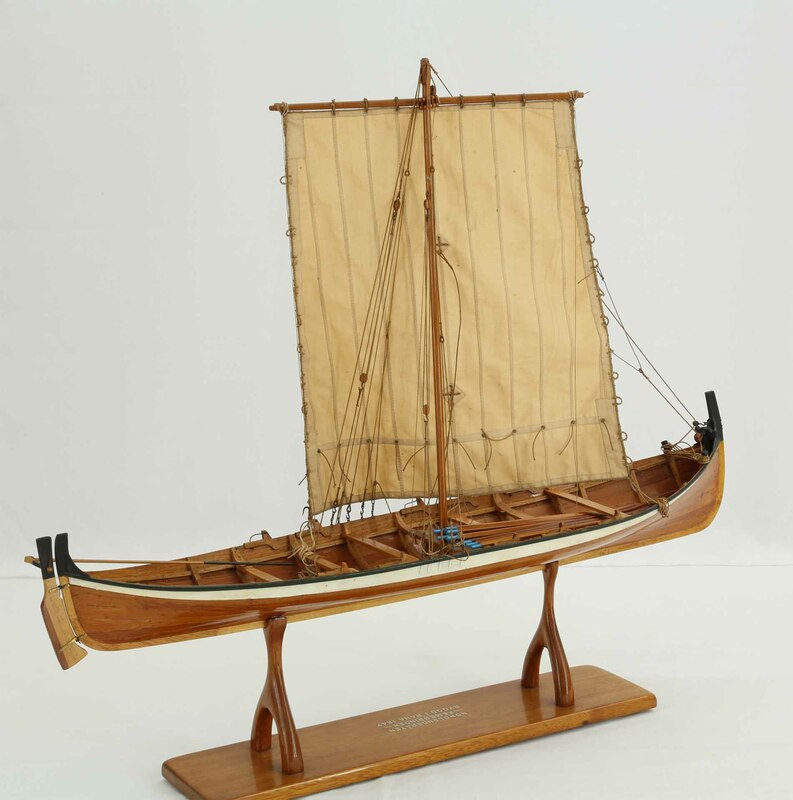 This model of a Nordland boat is an elegant, very beautiful work, a master piece. It was built by Jan van den Heuvel, Philippine (Terneuzen), Netherlands, with great care of details.